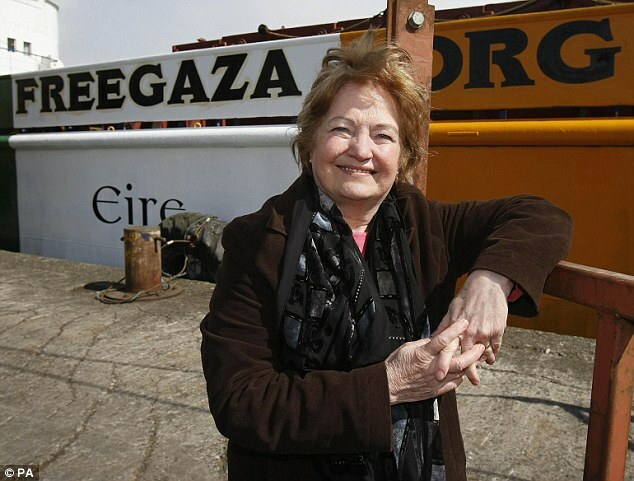 The Irish Nobel Peace Prize laureate on an aid ship heading to Gaza says the activists on board will not resist Israeli soldiers if they board the vessel. Mairead McGuire said this afternoon the 1,200-ton Rachel Corrie is 134 miles off the Gaza coast and is expected to reach Israel's 20-mile exclusion zone Saturday morning. She said the mission aims to deliver humanitarian aid to Gaza, which is under a three-year-old Israeli blockade. Israel has vowed the ship will not reach land. McGuire said the activists are prepared to be arrested and taken to Israel if Israeli soldiers board the boat. 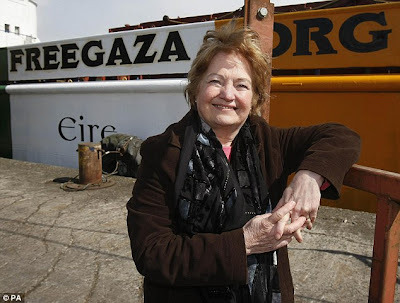 The Irish-flagged ship's attempt to break the Gaza blockade comes four days after an Israeli commando raid on a larger aid flotilla left nine activists dead. 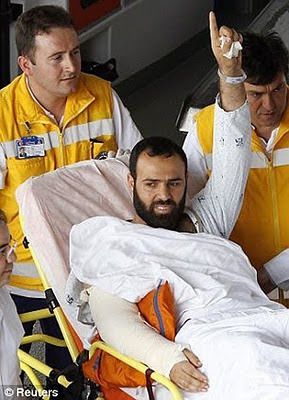 The attack sparked outrage around the world. It is not clear what the Israeli army is planning to stop the Rachel Corrie from reaching Gaza. Earlier this week a Navy commander told the Jerusalem Post that more force would be used if necessary. ‘We boarded the ship and were attacked as if it was a war,' the commander was quoted as saying. Today Greta Berlin, a spokesman for the Free Gaza group, says the 1,200-ton Rachel Corrie is heading directly to Gaza and will not stop in any port on the way. It is trying to deliver hundreds of tons of aid, including wheelchairs, medical supplies and concrete. The former head of the U.N. Oil-for-Food program in Iraq, Denis Halliday, is also among the 11 passengers on board, she said. 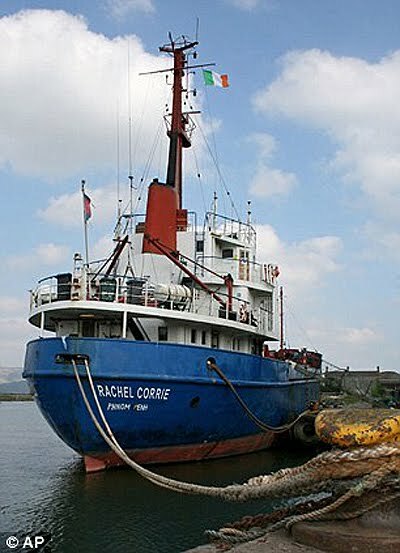 The Irish vessel is named after an American college student crushed to death by an Israeli army bulldozer while protesting house demolitions in Gaza. Israel will not allow the aid ship to reach Gaza, Israeli Prime Minister Benjamin Netanyahu told senior Cabinet ministers late last night. According to a participant in the meeting, he said Israel made several offers to direct the ship to an Israeli port, where the aid supplies would be unloaded, inspected and transferred to Gaza by land, but the offers were rejected. Netanyahu has hotly rejected calls to lift the blockade on Gaza, insisting that it prevents missile attacks on Israel. The Rachel Corrie's cargo of concrete is also a problem, because Israel considers that to have military uses. Netanyahu also instructed the military to act with sensitivity in preventing the Rachel Corrie from landing and avoid harming those on board the ship, the participant said. Israel has rejected demands for an international panel to probe Monday's deadly commando raid on the aid ships, saying it can conduct a professional, impartial investigation on its own. Activists say Israel sabotaged the previous aid flotilla, and Israeli defence officials said today only that unspecified 'actions' were taken when the boats were still far from Gaza. Without explicitly confirming sabotage, the officials say the Israeli actions only delayed the flotilla. They spoke on condition of anonymity because the information was classified. In Istanbul, Turkey's deputy prime minister said today that economic and defence cooperation with Israel will be reduced amid tensions after the killing of nine Turkish activists by Israeli commandos on an aid ship. Deputy Prime Minister Bulent Arinc said all deals with Israel are being evaluated. 'We are serious on this issue. New cooperation will not start and relations with Israel will be reduced,' he said. Energy Minister Taner Yildiz has said discussions about extending a Russian natural gas pipeline to Israel and providing fresh drinking water to Israel from the Manavgat river were being shelved. The pro-Palestinian activists' deaths on the aid ship increased tensions in the Mideast, especially with Turkey, an important ally of Israel. 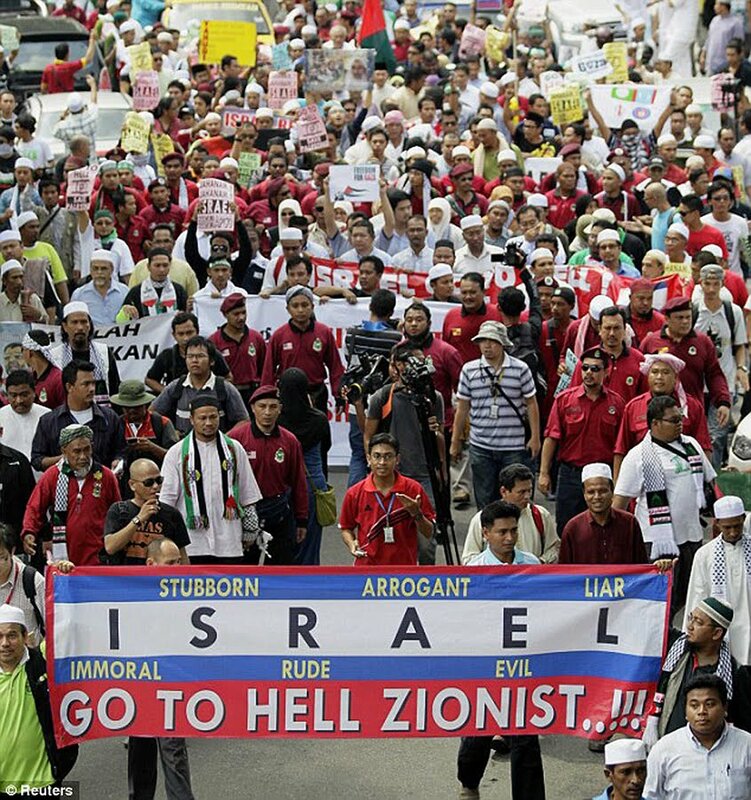 Yesterday, Prime Minister Recep Tayyip Erdogan called Israel's actions 'a historic mistake'. Israel maintains its commandos opened fire Monday as a last resort after they were attacked, and released a video showing soldiers in riot gear descending from a helicopter into a crowd of men with clubs. Three or four activists overpowered each soldier as he landed. Returning activists admitted fighting with the Israelis but insisted their actions were in self defence because the ships were being boarded in international waters by a military force. Thousands jammed Istanbul yesterday to pay tribute to those killed on the ship at a funeral service outside the Fatih mosque, and larger services were expected today. The youngest of the nine activists killed, Furkan Dogan, was to be buried today in his family's hometown in Kayseri in central Turkey. Get Paid To Read Emails. Free To Join Now! Get the Blog Ahmad Tarmizi widget and many other great free widgets at Widgetbox! 1. Komen dicatat dalam blog ini menjadi tanggungjawab penghantar komen terbabit sekaligus aku menafikan sebarang liabiliti ke atas komen itu. 2. Komen dihantar penulis tanpa identiti akan disemak dahulu sebelum disiarkan. 3. Komen berbentuk serangan peribadi, cacian dan makian TIDAK akan disiarkan. My site is worth$23,446.76Your website value? Pixel: Why I Returned My First Google Product! Windows 8 has launched in Malaysia! Get the Listen to Quran widget and many other great free widgets at Widgetbox!